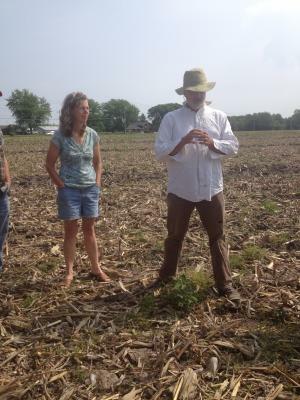 I attended a Restoration Agriculture Workshop at Sun Dappled Farm in Farmington, Il on Saturday. Mark Shepard from Viola, WI led the event. Mark wrote the book Restoration Agriculture and has spent the past 20 years managing 100 acres of land using Agroforestry techniques coupled with livestock. Mark's ideas are being tested by graduate students at the University of Illinois under the name Woody Perennial Polyculture. It was an inspiring workshop and I learned a lot from Mark that I will be sharing with farmers throughout central Illinois.